It is no secret that I like music. I was a total punk in high school, I made a fan site for Joe Strummer and I am currently in a Barbershop Group. So it will come as no surprise that I have a new musical favorite in my repertoire. I have fallen in love with this band. I don’t have much time to follow music so I must rely upon the music of the masses, radio. It usually doesn’t produce much in the way of moving or powerful and is usually dominated by the mediocre or the obviously trite. That is until the Knights came marching in. It’s not one of their best songs and it took a few repetitions before it really caught my attention. At some point I decided I liked the song enough to get it, but frustratingly enough the radio station would always play the song in the middle of it’s play list and they would never announce it. This only made me want it more. One day I was at work and it was burbling away out of a somewhat muted radio at one of my coworker’s desks. "I like that song, but I don’t know who that is." 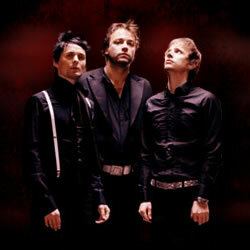 "Muse, what are they like?" "Um, well I guess they’re ok."
Knowing the opinion of this girl I thought they were worth looking into. I started downloading music. I noticed that they had a couple of other songs playing on the radio which, coincidentally, were the other songs I listened to the radio for. I downloaded them all and stopped listening to the radio for a while. Most bands strum out their music somewhere and refine it in the studio. These guys seem classically trained, as in they write the music and then play it later. I like talent. I also like noise with my music and they have plenty of that. Included in the desirables list is hard guitars, soft vocals and variety. They have all these things. The more I listen the more I like. I’ve included the clip above. It is a masterpiece of music. Enjoy.